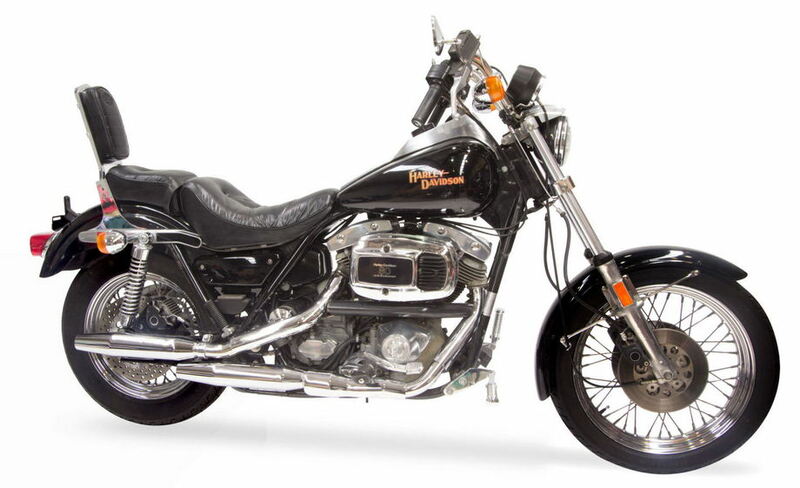 The Harley-Davidson FXR was produced in various models from 1982 to 1994 and again from 1999 to 2000. The models in the years from 1982 to 1983 were equipped with a shovel engine, while the rest of the models had evolution engines. Because of its rubber-mounted engine (rubber is placed in front of the engine and at the swing arm), the bike has many fewer vibrations than do the ordinary Harley bikes; this is appreciated by bikers who ride at high speed or for long distances – or both! One of 3,065 units ever produced, this FXR offers first-year stock equipment that reflects its first year of production: Shovelhead 80-inch FXR Super Glide II powerplant, stock exhaust, original Keihin carburettor and OEM air cleaner and stock cams. As a result, the engine idles in a rock-steady manner and provides very nice, predictable throttle response. This is the year of the oil control package for the Shovelhead engine which is a complement to the lower factory compression ratio of 7.4:1 that connects to a substantial flywheel. The result is a fuel-efficient, under-stressed, cooler operating powerplant with a flexible five-speed gearbox. With 96 foot-pounds of torque, it works pretty well. The clutch is smooth and linear and engages easily, benefiting from the then newly designed ‘dog leg’-style lever. The rear caliper has been fully serviced. The new pads are fitted to a satin-finished, stainless-steel rotor. The factory sissy bar can be removed for solo applications. The machine also comes with the original Owner’s Manual and a large file of Service Records. Note the original speedometer was replaced at 7,500 miles with a dealer-installed replacement speedometer. Total miles are 18,420. Since the machine was garaged its whole life, it really is as clean as it looks. If you like this model series and the idea of owning an original, first-generation piece, bid with confidence.